There are many different types of jobs available for people who want to work overnight hours. Whether you’re a parent who wants to minimize childcare expenses, a student who takes classes during the day, someone who needs additional income, or you’re a night owl who is most productive after dark, a night job might be the right fit for you. Of course, what the right fit means for you depends on your skills, interests, education, training and prior experience. Some of the jobs below don’t require much experience. For others, like emergency room physicians, you will need specialized training and an advanced degree. Here’s an overview of some of the positions available for workers who want evening, night, and graveyard shifts. If you're looking for a part-time evening job or for a weekend job, there are also plenty of options to consider. Keep in mind that the hours of your shift may vary depending on your employer and the type of position you hold. Evenings are the busiest time for emergency rooms, so there is a strong demand for doctors to work night shifts. Emergency room doctors must quickly diagnose and prioritize a broad range of illnesses and injuries. They must decide which tests and assessments are required to confirm diagnoses and make referrals to specialists as warranted by patient profiles. Emergency room physicians must complete a medical degree and licensing requirements in their state. They must also be familiar with emergency room protocols. According to Salary.com, as of October 2018 emergency room doctors earned an average of $278k, with a range of $237k and $326k. Air traffic controllers work at all hours when airports are in operation, including evenings and weekends. They monitor the movement of aircraft on the ground and in the airspace around airports. Air traffic controllers communicate with flight staff about appropriate approaches to - and departures from - airports. Some controllers monitor aircraft on routes from one airport to another. They inform pilots about weather and runway conditions and closures. Air traffic controllers usually require a bachelor's degree and must complete a Federal Aviation Administration training program, covering principles of aviation, weather, clearances, map reading, and similar topics. According to the Bureau of Labor Statistics (BLS), as of May 2017 air traffic controllers earned an average of $125k. The top 10% earned more than $176k. Physician assistants are increasingly being tapped in lieu of more expensive doctors to staff after-hours shifts as hospitals seek to control costs. Physician assistants assess patients' symptoms, adjust medications and carry out procedures. They also consult with physicians and specialists to modify treatment plans as warranted. Candidates must complete undergraduate coursework in science and hold a master's degree in an approved physician assistant program. According to the BLS, as of May 2017 physician assistants were earning an average of $105k, with the top 10 percent earning more than $146k. Ultrasound technologists and other medical imaging professionals must be available during busy evening and weekend hours to respond to injured and ill patients. They interpret doctors' orders and operate imaging equipment to determine the nature and extent of injuries, illnesses, and anatomical abnormalities. Medical sonographers must complete an associate's or bachelor's degree with coursework in anatomy, medical terminology, and applied science, and must have clinical experience in imaging techniques. Most employers prefer candidates who are certified by the American Registry for Diagnostic Medical Sonographers. According to the BLS, as of May 2017 medical sonographers were paid an average of $71k, with the top 10 percent earning in excess of $100k. Nurses can generally work when and where they want, and night work is usually an option. They must have the patience and sensitivity to help individuals who are often distressed and difficult to handle. Sound judgment is required when deciding whether to call in other healthcare professionals based on emerging symptoms. Registered nurses must complete either an associate's or bachelors-level degree at a nursing school or college including coursework in anatomy, microbiology, chemistry, and behavioral science. Ongoing learning is required to keep pace with current health issues and nursing practices. Nurses earn an average of $70k per year, with the top 10 percent of nurses earning over $104k according to the BLS in May 2017. Police officers can work evening and overnight shifts. They patrol roadways and neighborhoods and respond to accidents, crimes, and other emergencies. Police officers must understand and apply the law to emerging situations with discretion and sensitivity. They maintain relationships with community members in their area to help prevent crimes and secure leads when investigating crimes. Police officers need at least a high school diploma. College coursework in law or criminal justice is helpful and required for federal government and some state or municipal positions. They need to complete at least 12 weeks of training covering state, local and constitutional law, criminal investigation and civil rights, at a police academy. As of May 2017, police officers'average annual earnings were $63k, with the top 10 percent of officers earning over $105k, according to the BLS. Firefighters must be available at all hours to respond to fires and related emergencies. Most firefighters work 24-hour shifts, so they must be prepared to work both daytime and evening hours. They test and prepare equipment and carry out drills and exercises to prepare for emergencies in different settings. Firefighters must be prepared to take on dangerous assignments and risk injury and even death. A high school diploma is required to become a firefighter. Some attend fire training academies while others are trained on the job. Many firefighters complete EMT training as well. According to the BLS, firefighters received a median annual wage of $49k as of May 2017, with the top 10 percent earning in excess of $83.5k. Paramedics and EMTs staff emergency medical corps around the clock. They respond to emergencies and assess the condition of sick and injured patients. They provide emergency care and consult remotely with doctors about complex situations. EMTs safely transport patients to healthcare facilities as warranted. Paramedics and EMTs complete post-secondary programs in emergency medical technology. Some paramedics require an associate's degree. Advanced-level paramedics complete programs requiring 1,200 hours of instruction. According to the BLS, as of May 2017, paramedics earned an average of $33k, with the top 10 percent earning in excess of $57k. Night watch security guards are tasked with securing facilities at all hours of the evening and weekend. Security guards must patrol the premises where they work and monitor activity. They screen visitors and make sure that dangerous materials are not allowed into facilities. Security guards monitor visual feeds of activity, detain violators and write reports about violations. Security guards usually have a high school diploma. Supervisors and managers often have an associate's or bachelor's degree with coursework in law enforcement or criminal justice. Retired law enforcement professionals often gravitate to positions in the security field. According to the BLS, security guards earned an average of $27k as of May 2017, with the top 10 percent earning more than $48k per year. Opportunities abound for drivers to transport patrons from airports, bars, restaurants and other evening and weekend activities. Ridesharing service drivers are constantly rated by customers based on the quality of their interactions with passengers and level of customer service. Drivers are evaluated for their driving history and must have relatively clean records to be hired. A valid driver's license is necessary, and in some locations, a special license is required. There are also minimum insurance requirements. According to the BLS, taxi drivers earned an average of $26k as of May 2017. Uber estimates that its drivers averaged $19 per hour, with rates in excess of $30 per hour in New York City. 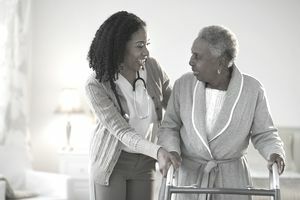 Certified nursing assistants and home health aides are needed around the clock in hospitals, nursing homes, assisted living facilities and in patients' homes. Due to the aging of baby boomers, this field has a very high projected growth rate (18 percent by 2024). They monitor and measure vital signs and observe the health state of patients. CNAs and HHAs bath, feed and change the clothing of patients and help them to conduct their daily activities. Certification requirements vary by state and healthcare provider but most workers must complete courses in basic patient care lasting from 4 to 12 weeks. According to the BLS, as of May 2017 nursing assistants earned an average of $27.5k, with the top 10 percent earning over $38.5k. Home health aides earned an average of $23k, with the top 10% earning over $31k. Hotel and resort front desk clerks greet and register patrons, answer questions about reservations, inform lodgers about the amenities of their establishments, respond to requests from patrons for items, and resolve problems with accommodation. Front desks must be staffed at all hours, so evening and overnight positions are often available. Positions at the front desk usually require only a high school diploma. On the job training is provided. According to the BLS, hotel and resort front desk clerks earned an average of $23k as of May 2017, with the top 10 percent earning about $33k. Freelance writers develop content for online and print publications. Though they may have deadlines or need to interact with editors during traditional business hours, most of their work can be carried out during evenings, overnight or on weekends. Writers often have a college degree and/or expertise in a particular content area, but candidates with strong and relevant writing skills can often secure work without formal academic credentials. According to Payscale, freelance writers earn a median wage of $24 per hour, with great variation based on experience and level of expertise. Consumers of all types of products and services demand access to customer service support during evenings, nights and weekends. Customer service representatives process orders, provide information, answer questions, and solve the problems for users of products/services. Cable companies, insurance entities, investment companies, banks and telecommunications companies are common employers of after-hours customer service representatives. Customer service representatives typically need a high school diploma and receive on the job training to learn about the products/services of their organization. Knowledge-intensive positions that deal with technical, business or investment products may require a bachelor's degree in that particular area. According to the BLS, customer service representatives earned an average of $16 per hour as of May 2017, with the top 10 percent earning more than $26 per hour. Intake workers for hospitals and urgent care facilities receive prospective patients and their families. They screen visitors regarding the urgency of their concerns and call in medical staff if immediate intervention is required. Intake specialists secure information about health insurance and other background information to establish a patient record. They distribute and explain forms for patients to complete regarding privacy, liability and other issues. Evening, overnight and weekend shifts are often available because most of these facilities are open 24 hours a day. A high school diploma is required and on the job training is often provided. According to Payscale, the middle 50 percent of intake workers earn between $13 and $17 per hour, with a median wage of $14.60 per hour. Residential counselors supervise troubled young people, persons with special needs, substance abusers, and others who require monitoring and support in overnight facilities such as group homes. They observe behavior and report changes or concerns to professional staff. They also model appropriate communication, intercede to diffuse conflicts and provide emotional support. Colleges and private high schools hire resident assistants to monitor and support students in residence halls. Evening, overnight and weekend shifts are available because residents need care and supervision around the clock. A high school diploma and strong interpersonal/communication skills are sufficient for many jobs. College coursework in human services, social work or psychology is desirable. According to Payscale, the middle 50 percent of workers receive between $12 and $14 per hour, with a median wage of $13. Colleges may provide housing and/or meals to residential assistants. Graduate students in relevant programs may also receive free tuition.